Behold the blast-furnace beast: The MSR XGK-EX: powerful, simple, dependable. It's been a while since I've had the opportunity to do a stove review (work, family, studying, etc. ), but the opportunity to review an XGK-EX came up, and it was with the Section Hiker blog, a blog with which I've had successful collaborations with in the past. And, given that winter fast approaches, what better stove to review than a tried and true snow melter? The XGK line of stoves from MSR really ushered in the modern stove era. A lot of stoves prior to the introduction of the XGK line were good stoves but were heavy, vulnerable to wind, and because of their small fuel tanks, required the carrying of a separate fuel bottle for refilling. The Model 9, the first stove in what became the XGK line, was a significant step forward in terms of design and technology. Larry Penberthy, the founder of MSR, was a engineer with a gift for innovation who loved mountain climbing. He just wasn't satisfied with the gear of his day and decided he could do better. It was Mr. Penberthy, for example, who really introduced non-wooden handles on ice axes. Prior to Mr. Penberthy, pretty much everyone was still using wooden handles on their ice axes. I hope you fine the review to be of interest. MSR has come out with a remote canister version of their popular Windburner stove. I've posted a full review of the new remote canister Windburner on the SectionHiker.com website. This blog post is a review supplement where I will post extra photos and a chart of weights that didn't make it into the review. The new burner is about 52 grams/1.8 ounces heavier than the original. Interestingly, the new burner packs down into about the same amount of space as the original. Note that the original canister stand weighs 0.6 oz, and the canister stand on the 1.8 L version weighs 0.7 oz. One would not need to take a canister stand with the remote burner, so the real difference between the two is about one ounce – if you typically bring the canister stand. I personally don't always bring the canister stand on the 1.0 L version, but I typically do bring the canister stand on the 1.8 L version. What's the difference between the original burner and the new remote burner? Well, take a look at the photo below. The original burner, left, is an upright (top mounted) type burner that screws directly onto the canister. The new burner, right, is a remote type burner that is connected to the fuel by a hose. A remote style burner sits a lot lower, especially on larger sized fuel canisters, and is generally more stable. A remote burner can support larger pots. Notice in the below photo how much lower the remote burner sits. Left: New remote burner, with 2.5 L pot. With the introduction of the remote burner are two new pots, a 2.5 L and a 4.5 L pot, both pots that are much larger than would be practical on the original burner. However, any Windburner pot will fit on any Windburner stove. MSR will continue to offer both the original upright burner and the new remote burner. Also introduced is a new Windburner frying pan with a ceramic based non-stick coating. The 2.5 L pot also has the non-stick coating. In my cooking, I have to say that the non-stick feature really works well. As I said, any Windburner pot (or pan) can be matched with any Windburner stove. It's up to you to decide which combinations are practical. In the below photos, I've swapped the 1.8 L and the 2.5 L pots, placing the 1.8 L pot on the remote burner and the 2.5 L pot on the upright burner. I'm not sure how many people would put the 2.5 L pot on the original upright burner, but the 1.8 L pot on the new remote burner is definitely a winner. MSR will be selling this combination, the 1.8 L pot with the remote burner, as a standard set – although you can still buy the 1.8 L pot with the original burner if you prefer. Here, I've switched the 1.8 L pot (left) over to the remote burner. The 2.5 L pot (right) is now on the original burner. Several people have asked, "can I use a firesteel to light the stove?" Yes, absolutely. In fact, the wide burner of the Windburner is just absolutely perfect for use with a fire steel. The rim around the burner helps retain the gas at the burner head and helps funnel the sparks right into the burner. The Windburner is one of the easiest gas stoves that there is to light with a firesteel. Incidentally, MSR makes a really nice firesteel, a firesteel I actually prefer over the Light-My-Fire brand. MSR's lanyard is longer and easier to use. Light-My-Fire's lanyard always seems to be just a tad too short which I find aggravating. MSR's lanyard is long enough to slip it over one's neck while working around the "kitchen" area of one's camp, which I find convenient. A fire steel is the perfect way to light a Windburner. The fire steel shown here is the excellent MSR firesteel which I actually prefer over Light-My-Fire. Well obviously groups. The new remote burner will support a 2.5 L and even a 4.5 L pot. For any use other than snow melting, I generally recommend about 750 ml capacity per person (I recommend 1.5 L capacity per person for snow melting). Thus, the 2.5 L pot is more than adequate for three people and would do for four if you were just doing simple cooking (i.e. just boiling water type cooking). The 4.5 L pot would be suitable for up to six or seven people. 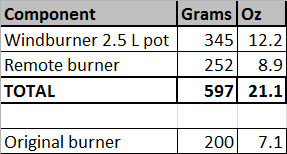 Not only would groups want the larger pots but also families with children, Scout groups, or any group that wanted a more stable pot set up than the tall original burner provides. The new remote burner provides a stable cooking platform for the more junior hiker. I mention it in the full review, but I just want to reiterate that the new 2.5 L pot on the new remote style Windburner is an excellent cooking system. On New Year's Day, I made a really nice, fluffy frittata using nine eggs. It's hard to get a frittata with nine eggs cooked all the way through without burning the bottom. The new Windburner with 2.5 L pot did an excellent job of it. The new remote burner with the new 2.5 L pot (or the optional frying pan, sold separately) is a greatly improved cooking system, a system upon which one can do some real cooking. It may not be the ultimate Gourmet set up, but it does a danged good job on things beyond just boiling water. Manufacturer: MSR, a division of Cascade Designs. Materials: Aluminum pot with steel (primarily) burner. Pot Dimensions: 15 cm/6" tall, 18 cm/7" wide – with approx. 1 cm (0.4”) additional for pot handle hinge. Size/Model tested: 2.5 L/84 fl. oz. pot with remote type burner. Requirements: A standard threaded canister of gas (sold separately). The stove in this review was provided at no cost to me by Section Hiker with the understanding that I would review the stove as I saw fit, in other words, with no restrictions or preconditions. I have reviewed the stove accordingly. Neither I myself nor Adventures in Stoving have any financial relationship with MSR, the manufacturer of the equipment reviewed. In addition, I receive no remuneration for the writing of this review nor do I receive any benefit from the sale of any stove discussed in this review.